I started playing Papers, Please around 7:00 on a Thursday night. Around 45 minutes into my session, I distinctly remember thinking to myself that I couldn’t see how the game, while fun, could keep being compelling for much longer. My wife then poked her head in the door to tell me she was going to bed. “Isn’t it a bit early for bedtime?” I asked her, looking at the clock on the wall to my left. It read 10:15. Not a mere 45 minutes, but a full three hours since I had started working the Grestin Border between Arstotzka and Kolechia, and I wasn’t even close to calling it a night yet. Papers, Please is a triumph of indie game development, and one of the best games I’ve had the pleasure of playing this year. On the surface, Papers, Please is not a complicated game. You are an immigration officer working for the fictional Eastern Bloc nation of Arstotzka. Your job is to check the papers of people trying to enter the country, and grant or deny access based on whether those papers are all in order. The basic gameplay hook is easy to spot, too. You get paid by the person, and must process enough to keep your family warm and fed. Make mistakes, however, and you start to receive docked pay. The key is to go fast enough to pay all your bills, but slow enough to make sure you get everything right, and the game strikes this balance very well. Of course, it’s not that simple. By the third week, all foreign visitors must have a passport, an entry ticket, an ID supplement, and a certificate of vaccination. All these forms must be legally issued, match each other, have valid information, and not be expired. Diplomats, asylum seekers, workers, and Arstotzkan residents have different papers. Entrants must look like their picture and be of matching height and weight, with fingerprint records available to check discrepancies. You may be ordered to refuse all entrants from a certain nation, or confiscate all passports issued from a certain district. Your pay per person doesn’t increase, but your rent might. Or you might need to buy medicine. Or a birthday present for your son. 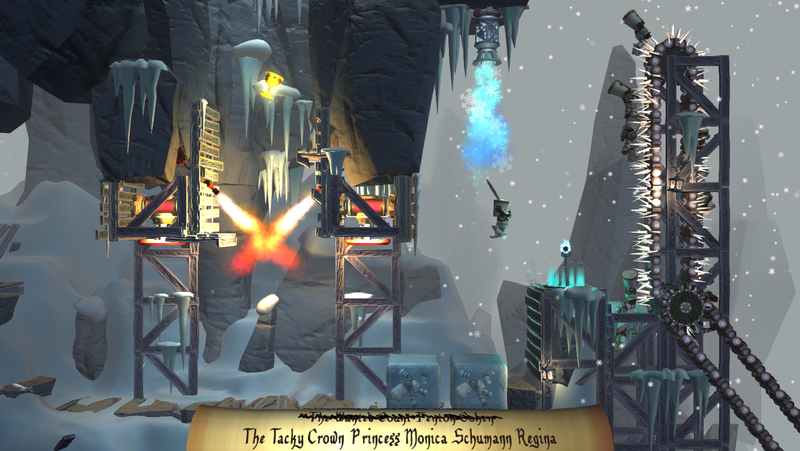 The increasingly complicated puzzles coupled with the fine balance between speed and accuracy makes for quite a compelling game all by itself. But Papers, Please is much more than a simple puzzle game, even one as well done as this. Where Papers, Please really starts to stand out is in its attempts to get you to willingly make a mistake. Do you separate a husband and wife when one has legitimate paperwork and one doesn’t? Do you reunite a guard and friend of yours with a girl he met during the war, even if she has no papers? Remember your family, and that doing these things will get you penalized. Do you condemn people with false papers to your nation’s prison system, or simply send them away? What if a guard cuts you in on the bonus he gets for each detainment? Is it worth taking a 10 credit bribe to let someone with bad papers in? What if you know they’re smuggling a bomb and plan to kill people with it? What if you couldn’t afford food yesterday and your son is sick? Without getting too much into spoilers, there are many of these questionable decisions spread throughout the story’s 31 days, and they elevate Papers, Please high above shuffling papers and stamping passports. 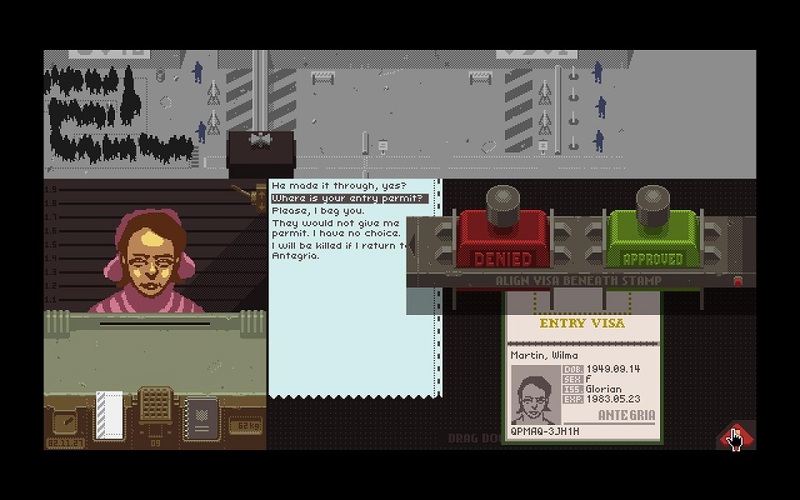 Speaking of shuffling and stamping, Papers, Please does a great job of conveying a real-world feel in a virtual space. Moving everyone’s papers around by hand on the small desk makes everything feel very tangible, and it isn’t long before you figure out your own efficient way of checking names and dates and seals that works around the limited desk space. The color scheme, art style, and lack of music all accentuate the grim feel without making it oppressive, and the satisfying “ka-chunk” of the stamp wonderfully punctuates each inspection. 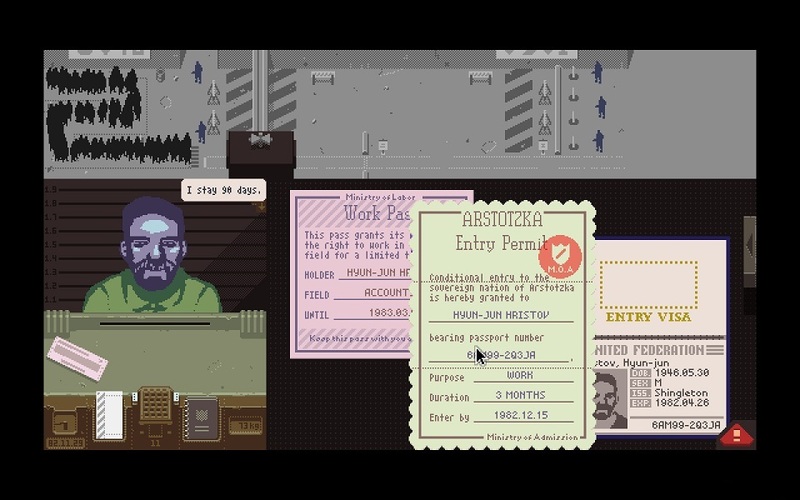 Papers, Please just feels satisfying, which is important considering the otherwise quite depressing subject matter. At its core though, Papers, Please is a game that defies solid explanation. Any attempts to explain it to friends and family have made even me feel like it can’t be that much fun. Words have a hard time explaining the pride of knowing an issuing city is wrong purely from memory, or the paranoia of knowing that no matter how careful you were, you probably forgot to check something. It’s difficult to convey the range of feelings you get when you spot a mistake early, get excited because it means that you might be able to process an extra person and maybe afford a birthday present for your son, then realize that you’re happy because of the random misfortune of another human being. All in all, Papers, Please is a game that everyone should know about, but also a game that must be played to truly understand. Luckily, it’s absolutely worth playing and comes at a bargain price, leaving most gamers without an excuse to not pick up this masterpiece of indie gaming. Papers, Please was created by Lucas Pope, and can be purchased on Steam, GOG.com, and via Humble Store on its own site. PlayStation Now: Does it Need to Change to Survive? In many ways, PlayStation Now is shaping up to be Sony’s biggest missed opportunity of the PS4 era. Crackdown 3 or Anthem: Which is More Disappointing? Should Resident Evil 8 Be Like Resident Evil 7 or Resident Evil 2? Xbox employees get white Xbox One design, jealous? Got a gaming tip or suggestion for Gameverse? Want to contribute? Let us know. Gameverse - News, reviews and opinions about the video game industry. HD Report - High-definition news, technology, & entertainment. 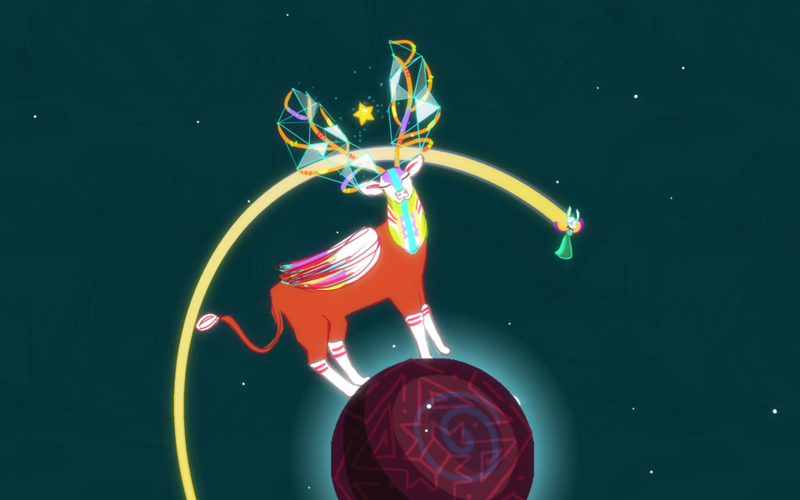 IndieGameSource - Website dedicated to the indie game industry.